I’m a sucker for an awesome outdoor patio space or backyard. That’s the first thing I always look for in a home. Because I LOVE backyard parties in the summer. There’s not much in life that can beat the simple joy of having friends and family over for burgers and beer on a summer night. BUT… when the sun goes down it can get too dark without the right outdoor lighting solutions. And that can put a damper on your party. 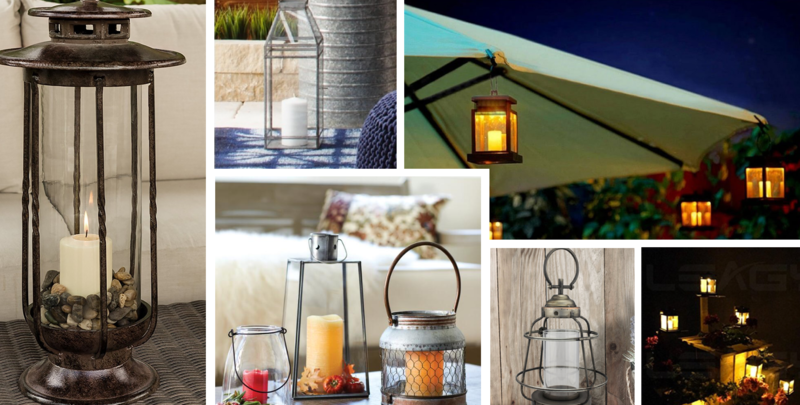 If you’re looking for some simple yet stylish outdoor lighting ideas to amp up your garden or patio, you’ve come to the right place. 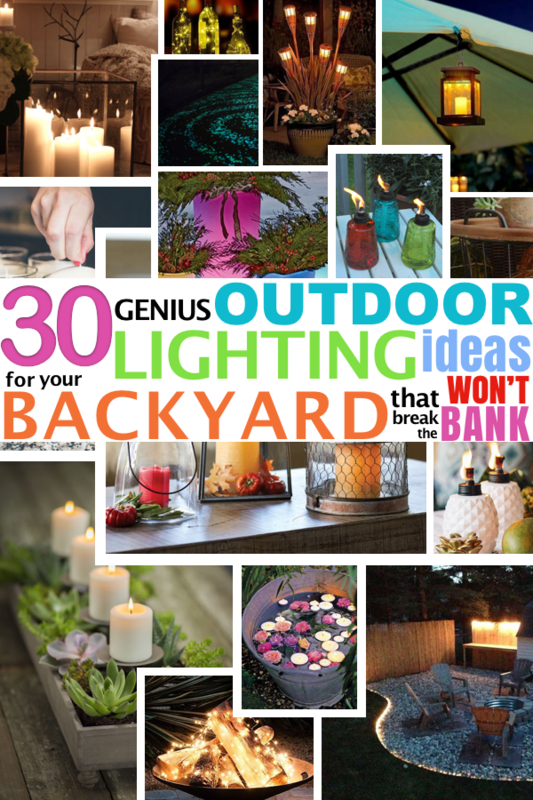 From string lights to tiki torches, I’ve got you covered with the latest and greatest products and ideas out there that won’t break the bank. 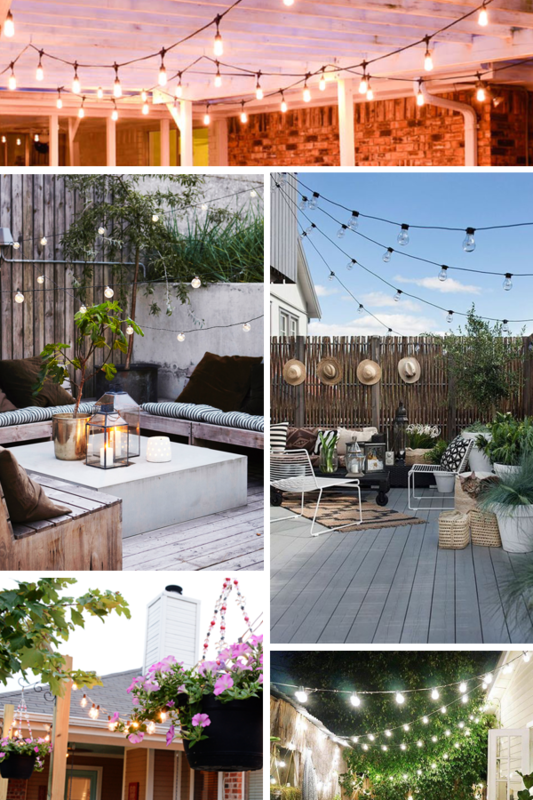 I recommend choosing a combination of some of these backyard lighting ideas to really warm up your space and set the tone for fun and countless long summer nights to come! We’ve seen string lights, they are everywhere. and for good reason—they’re magical. If you have a tree out back or if your deck or patio is cradled by other exterior walls then this is a pretty easy option and can be put up in no time. All you need are string lights like these (or rounder bulb string lights like these) and hooks. AND if you want to be energy efficient, there are even solar powered string lights! (I like these mini paper-lantern-like solar powered ones too!). This is definitely a great solution if you are wanting to light up an area of your backyard and don’t have easy electrical access. If you don’t have an access tree or wall to hang your string lights, you’ll need to create some tall poles around the perimeter of the area you wish to light. These poles don’t have to be an eye-sore. You can incorporate them into the overall plan of your outdoor space. What you choose to do depends on your setup and your preferences. If you have a patio and not a deck, you’ll probably want to make free-standing poles stabilized inside of planter pot or crate using cement. We did the pole support in cement and top with rocks thing for our string lights poles—I’m no longer a fan a few years later. The pots we chose were too small and, when it gets windy out, blow down easily. I do like the look of bigger pots with planted flowers on the top, it’s a great way to add more plants pops of color to your outdoor space with minimal effort. If you do choose this option, make sure you’ve allowed enough space for roots to develop and for water drainage. you can make the whole free-standing light post in cement and a pot yourself, like we did. Personally, after doing that, I think just attaching the poles to our deck railing would have been way easier. String lights are an easy and affordable outdoor lighting solution. Just remember to take the lights and/or poles down during a big storm…we’ve already lost 2 of our 6 this way. Whoops. Chances are you’ve got a few strands of Christmas lights lying around, and these can be such an easy and inexpensive option to light your backyard. I love the idea of wrapping light strands around logs in a fire pit for an instant glow. Or creating your own make-shift outdoor chandelier out of white lights and a hula hoop. 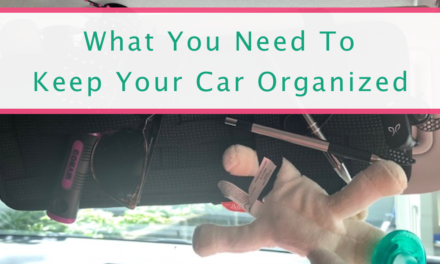 Or maybe you just don’t want to take the time to unravel that ball of lights that’s been sitting in the attic—that’s okay! 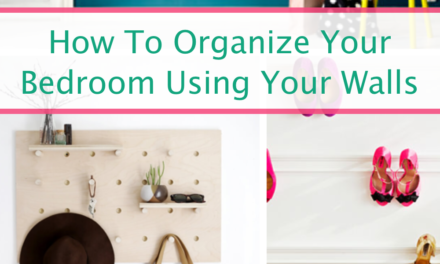 Just throw that mess under in a crate or make a DIY side table to add some extra glow to your night. One thing you may not have already is fairy lights, or smaller white lights, and these are perfect for creative outdoor lighting. AND guess what? There is a solar option for fairy lights too! 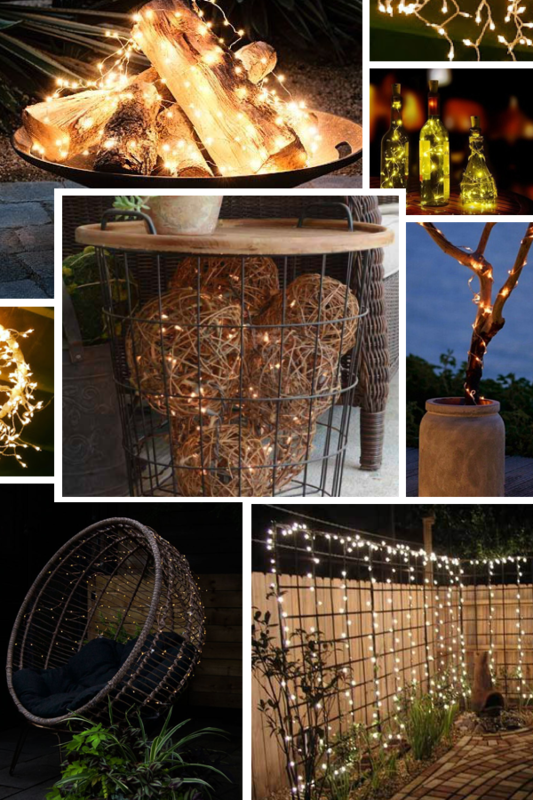 Wrap fairy lights around trees or even sticks, stick them in old wine bottles or glass jars as centerpieces, or heck—even weave fairy lights along your outdoor furniture to really make your seating pop. Rope lighting can be used to light up your pathways and railings without breaking the bank, and it isn’t hard to set up. Wind rope lighting strands along garden beds or around the rim of your patio for glow that will definitely guide your guests to different areas in your yard. All you need to complete this quick DIY are rope lighting (of course), an outdoor extension cord, garden landscaping staples, and end caps for LED rope lighting. And probably a good 30 minutes to an hour to get everything set and in place. Oh, and yes, there are solar-powered rope lights option too (in case you were wondering!). Candles are—of course—a classic lighting solution and they set a calming tone to your surroundings. Use bunches of candles as centerpieces or place them in glass containers for a fun vintage-y effect. 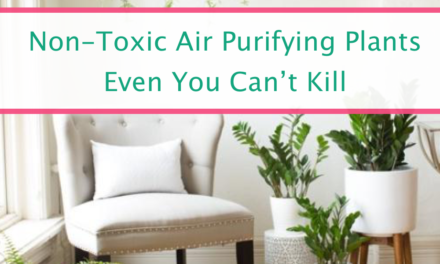 Float them in galvanized metal basins or in mason jars (just make sure you add some herbs and essential oils to the water to keep the mosquitoes at bay!). I’m a sucker for a good candle. Especially candles that smell good, last a long time, and are free of giving off toxic chemicals, like these. Okay…I tricked you—but seriously, LED candles are way more cost efficient and they are free of harmful toxins and phthalatates. So they don’t necessarily have any smell to them, but who cares… you’re OUTSIDE in the FRESH AIR. I also like these flameless LED candles because they have a 5 hour timer so you don’t have to worry about going around and switching each one off at the end of the night. Oh, and there are also solar-powered candles already in lanterns—I mean, could it get any easier? Tiki torches are nothing new, but there are some fun ways you can be creative with them and give them new life. I’m also really liking the tiki torches-in-a-flower-pot look. But don’t get regular tiki torches, get these solar LED flickering light tiki torches to place in your flower pots. You can adjust the sizes of the torches and don’t have to worry about the flames going out! But you don’t have to go for the look for the traditional tiki torch if you want a flickering flame. Find a use for your old wine bottle (or better yet, use this as an excuse to drink more wine) and make your own torches to line your fence or railing. If you are looking to add a bit more flare to your table centerpieces, try out these colorful mini table torches or these mini white pineapple torches to add a bit of flame and fun. Okay, we already looked at those solar-powered lanterns with candles already in them– which are great – but you can bypass getting candles another way by just getting flickering faux flame lanterns. Use these to line your walkway or hang on hooks to light up your flowerbeds. ones on poles, ones with lights already in them, and ones that are free and open to put candles in. I saw an image of glow-in-the-dark flower pots on Pinterest, and thought that would be a great cheap and easy DIY outdoor lighting solution. Problem is, from what I read, it doesn’t really work. You could even do a different take on the whole floating candles idea and use these waterproof color-changing floating tea lights. They kind of look like they are glowing in the dark don’t they? 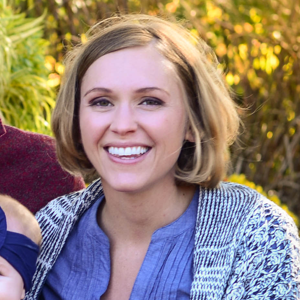 And…yep, you guessed it—there is also a solar-powered option! These solar illuminated planters are a bit more pricey but they’ll definitely deliver on setting the right tone and atmosphere for any party. If you want to do something really cool, check out these glow-in-the-dark garden pebbles. 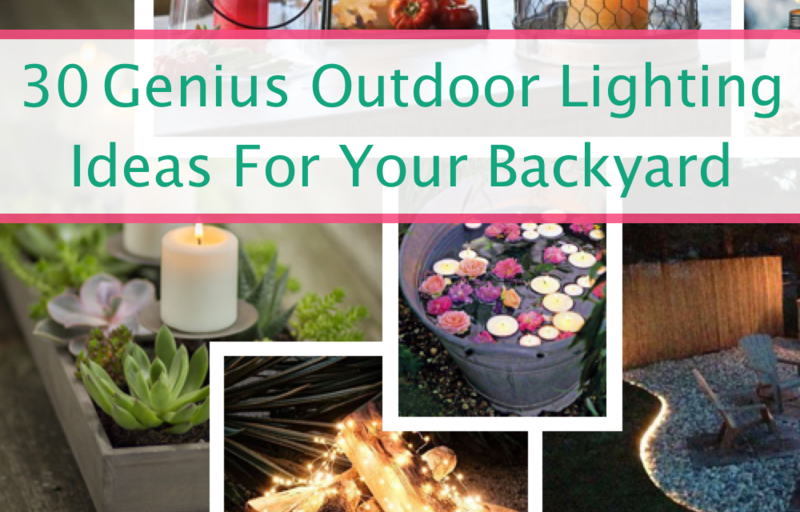 Fill up some glass jars, top off potted plants, or be adventurous and illuminate a pathway. Whatever you do these are sure to be fun for a long time! So pick a combo of these ideas to add to your backyard, and you’ll have a great after dark atmosphere in no time!